7 Money Habits to Change Your Life! Find contentment faster with our exclusive digital bundle! I've never read a book about money that takes this approach--and that's a good thing! Comparison has a way of weaving itself throughout all aspects of our lives, including our money. 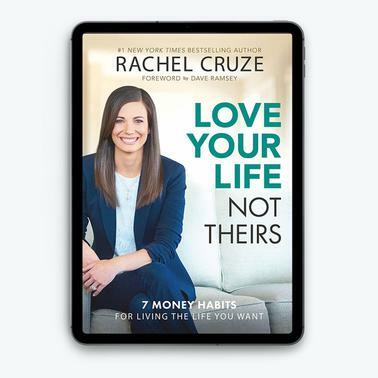 In Love Your Life, Not Theirs, Rachel Cruze outlines the seven money habits that really matter--and they have nothing to do with keeping up with the Joneses! 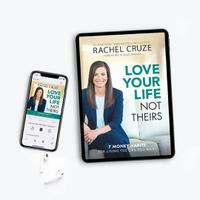 Love Your Life, Not Theirs is full of the kind of practical, straightforward advice we've come to expect from Rachel Cruze. She offers guidance on paying down debt, smart saving, and the right way to talk to your spouse about money. These indispensable tips can help with day-to-day spending decisions and put you on a path to establishing healthy financial habits. Cruze's self-deprecating and honest voice is a great resource for anyone wanting to take charge of their money. With humor and approachability, she helps her readers set themselves up for success and happiness, no matter what current financial state they may be in. In today's world of social media, the temptation to play the comparison game is stronger than ever. Love Your Life, Not Theirs is the perfect reminder that, when it comes to money, comparison is a game you can't win. A terrific--and much needed--read.